Fall is such a beautiful time of year, and it has arguably the richest color palette of any season. The season is marked by transitions of color, from the green remnants of late summer to the deep ochre and auburn of mid-autumn, and through to the cooler tones that mark the start of winter. Discover five color palettes which capture an aspect of this cozy season—themed on Harvest, Hygge, Woodland, Halloween and Mid-Century. Whether you’re creating an autumnal-themed newsletter, designing a logo which captures the spirit of Fall, or creating illustrations with a woodland theme, you’ll be sure to find a palette here to suit your design. You’ll also pick up some tips for how to apply your color palette to different designs, and how to convert swatches for print and digital design. The color palettes here are listed as CMYK swatches. CMYK is suitable for print design, for example if you’re creating a flier, poster, book cover or anything else you intend to print professionally. If you need approximate Pantone values for the swatches, you can use a color conversion tool like this one. If you want to create a design for viewing on a screen, like a web banner or social media image, you should convert the CMYK values to RGB values for each swatch. Optionally, you can also convert these to Hex values. Head over to Adobe Color where you can convert any CMYK color to an RGB swatch or Hex code instantly. You can find links to download each CMYK color palette below. These are saved as Adobe Swatch Exchange (.ASE) files, which you can open in Adobe Illustrator, InDesign or Photoshop by navigating to the Swatches panel in the application. 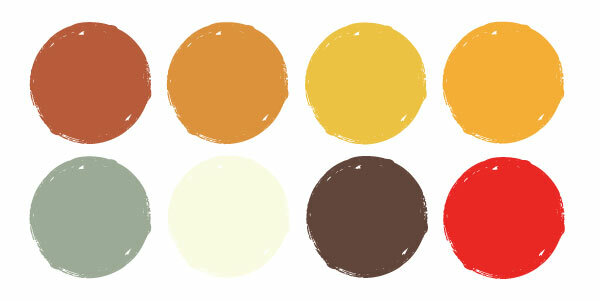 Our first color palette is themed on harvest, which often takes place during the first few weeks of autumn. This is a time when the richer colors of autumn, like deep oranges and ambers, mingle with the last few traces of a green and vibrant summer. This palette has a lively, optimistic mood which moves from cooler green tones to warmer red and pink swatches. Because this palette is cheerful and welcoming, it makes a great fit for publicity design, including fliers and posters. If you’re hoping to draw in the crowds to a Fall sale, this is the palette to go for! 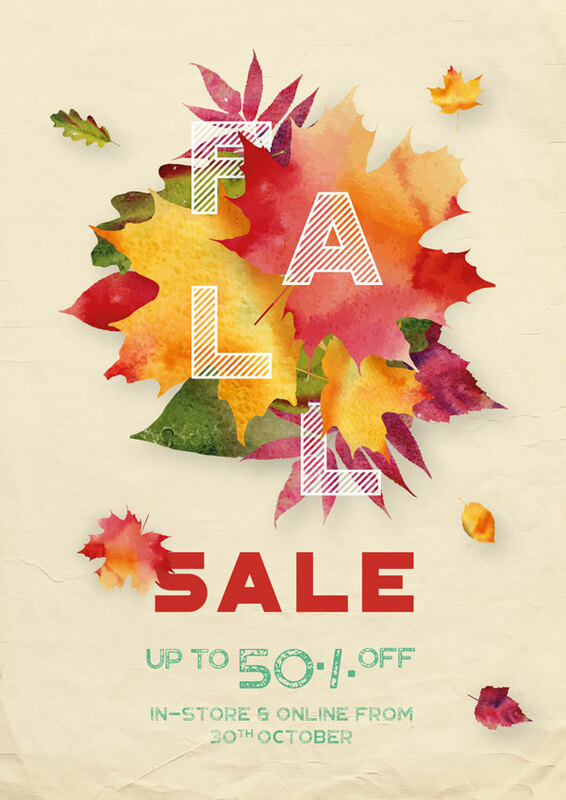 We’ve set up this poster design in Adobe InDesign, layering watercolor leaf vectors in the Harvest palette shades over a papery background. Adding typography set in Portico keeps the layout feeling clean and modern. 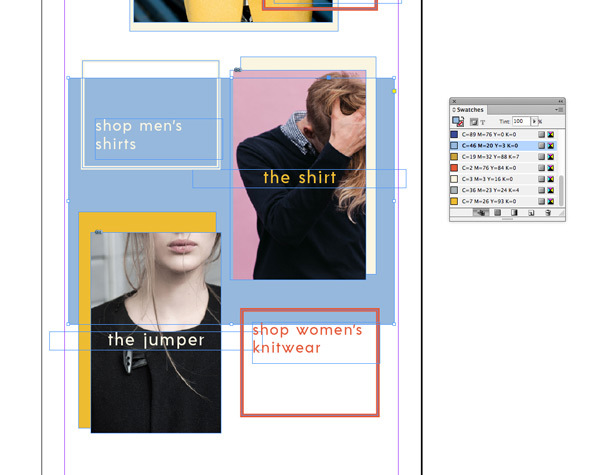 Top tip: To work with color swatches in InDesign, expand the Swatches panel (Window > Color > Swatches). From the panel’s drop-down menu choose Load Swatches. 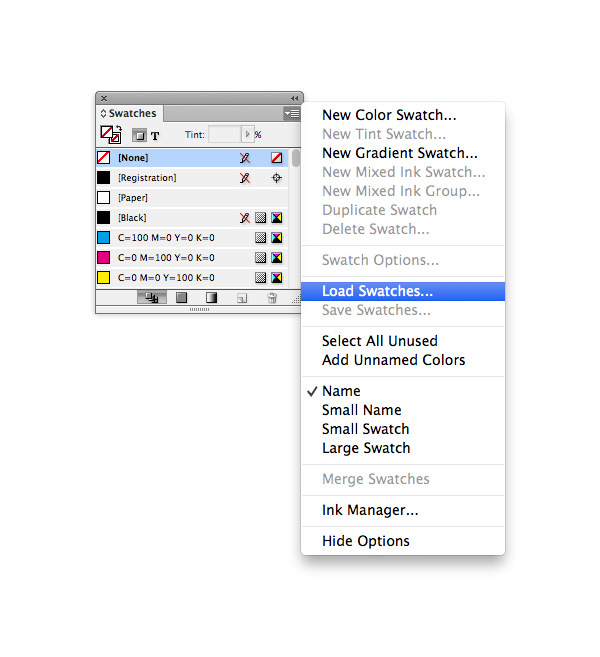 Navigate to your ASE file and click Open to load them into the Swatches panel. ‘Hygge’ is a Danish word which evokes coziness and wellbeing during the winter months. Having recently discovered this wonderful approach to embracing the colder weather, the rest of the world seems suddenly to have embraced the concept of Hygge wholeheartedly. The Hygge color palette takes inspiration from its Scandinavian source, with characteristically cool colors like icy blues and grays creating a stylish base. Hygge is all about the contrast between the cold outside and the cozy interior, so the palette is completed with warmer swatches in deep, rich tones of yellow and orange. This is arguably the most stylish of the autumnal color palettes presented here, so it would make a great fit for any design which needs to be a little more high-end. Media for retail, like e-newsletters, lookbooks or catalogs, would make the perfect home for this stylish yet subtle set of swatches. 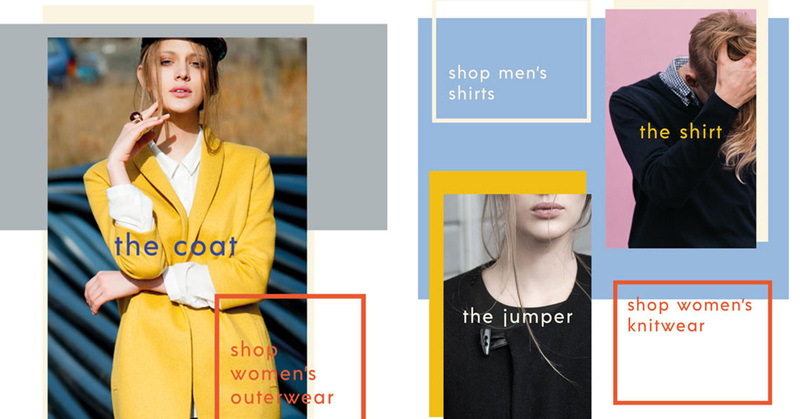 As an example, we’ve laid out a concept design for a sales email for a fictional Scandi-inspired fashion brand. Choosing photos which complement the palette—note the mustard yellow coat and pink background—help the layout to feel harmonious. We’ve also opted for a clean sans serif, Acre, to enhance the Scandi vibes of the design. 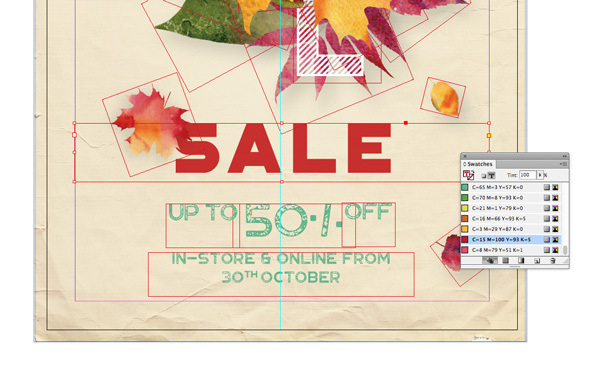 Top tip: You can create simple shape graphics like in the email example here by using the Rectangle Tool (M) in InDesign. Hold down Shift while you drag if you want to create a perfect square. Fall is the perfect time to get wrapped up and get out into nature. This Woodland palette is inspired by the beautiful colors of the trees at this time of year, whose leaves turn to various beautiful shades of rust, yellow and crimson. This palette is more muted than the others, which lends any design a pared-back, rustic look. 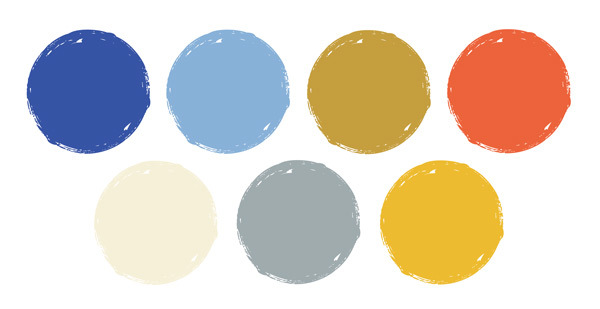 If you want to create a design that’s calming and evocative of nature, this palette is a great choice. It makes a lovely scheme for book covers and illustrations. 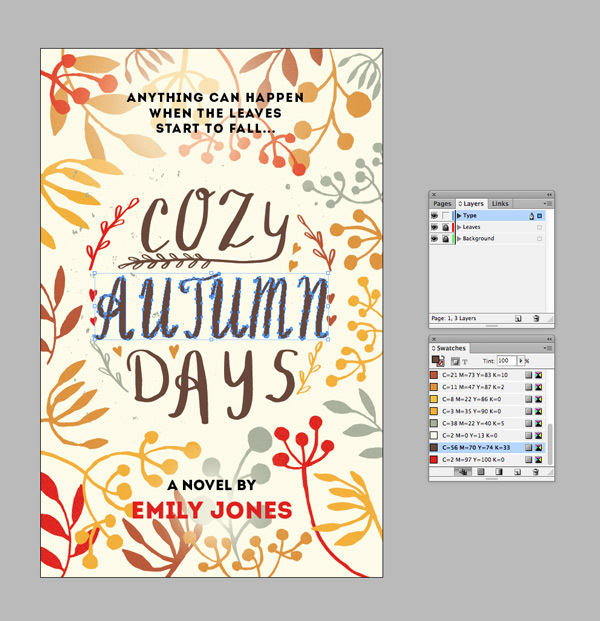 As an example of how you can apply the palette, here we’ve created a design for the front cover of a paperback book in InDesign. Splitting the different elements of the design—the background, the leaf graphics, and the typography— help keep the layout organized and prevent me from mistakenly moving parts of the design around. 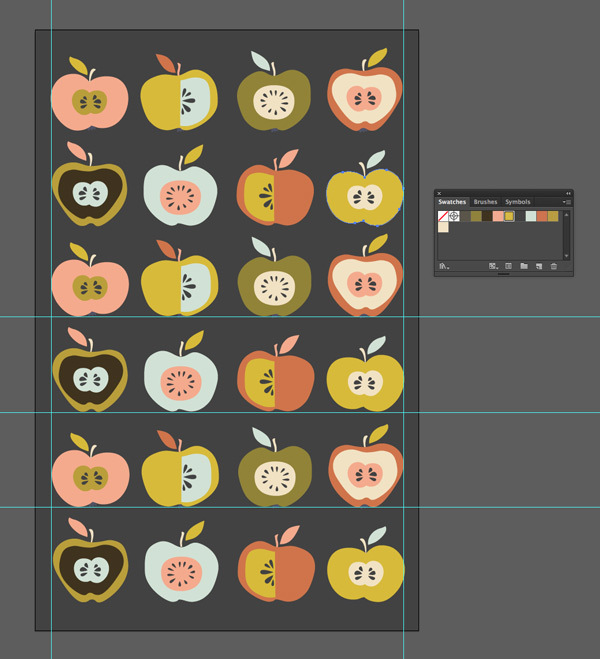 The leaf graphics are taken from a watercolor vector image, before changing the color to solid swatches from the palette in Illustrator and then pasting the vectors directly into InDesign. 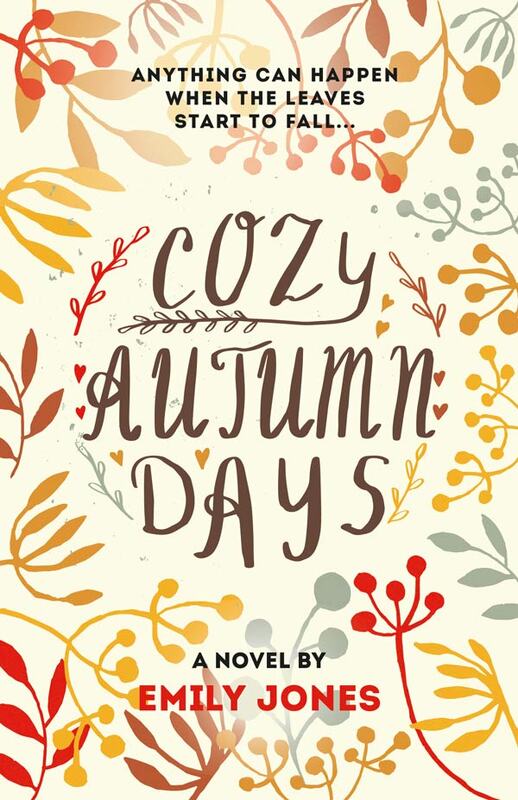 The autumn title text is a hand-lettered vector which you can find here. 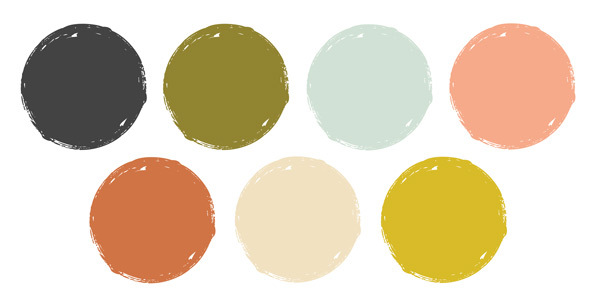 Top tip: Don’t be afraid to create a busy layout when using a muted color palette like the Woodland palette. These colors are designed to work together to create a scheme that feels calm and collected, however much detail is present in the design. Who doesn’t love Halloween?! The spookiest time of the year marks the end of autumn and the start of winter, and is celebrated all over the world. Halloween marks a departure from the cozy delights of harvest time and woodland walks, instead giving a more sinister twist to Fall. For this reason, the Halloween palette is different from the rest of our more russet-hued collections. This scheme is a little jauntier, contrasting moody purple with sinister red and ghoulish green. The additions of a deep black and startling white adds attention-grabbing contrast. If you’re looking for the perfect palette for a Halloween event flier or poster, these swatches feel pitch-perfect for the spooky season and won’t fail to catch the eye. 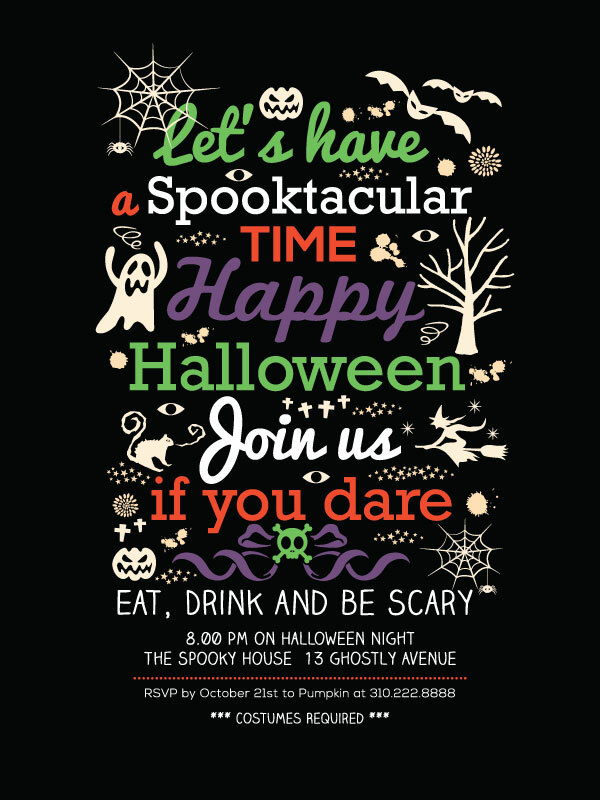 We’ve tweaked the color scheme of this Halloween party flier to make it feel a little bolder. The increased contrast in the palette helps the text to be highly legible, even when set against a busy, dark background. Top tip: If you have a layout that’s text and image-heavy, try making a clear separation between the two by applying your color wisely. Apply brighter, more visually arresting colors to text elements, and keep graphics more neutral by sticking to a palette of white, cream or black. This will help the design to be more legible, even when viewed from a distance. 1950s style might not be the first thing you come to when thinking about autumnal design, but mid-century designers were actually heavily influenced by Fall colors and natural imagery. The Mid-Century Modern movement is notable for its use of muted, earthy colors, which designers applied to illustrations, fabrics, posters and books. The Mid-Century palette pays tribute to the sorts of colors favored by Fifties designers. Charcoal grays and khaki greens keep the palette feeling ultra-stylish, while pastel tones add authentic mid-century charm. Make like the mid-century designers did and apply your palette to patterns, to create wallpapers, social media backgrounds or posters. 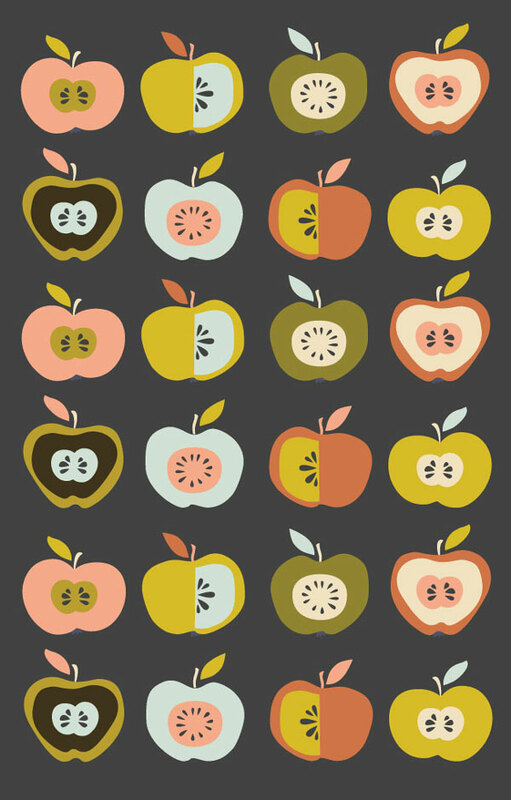 We’ve used some basic apple vectors from this illustration and created a mid-century inspired pattern in Illustrator. Try varying the arrangement of colors across a series of two rows, before copying and pasting the pair of rows to create a uniform sequence. Top tip: Creating vector patterns is simple to do in Illustrator, but you’ll help your pattern to look more uniform by making good use of guides. Make sure your rulers are visible (View > Rulers > Show Rulers) and then drag down horizontal guides from the top ruler, and vertical ones from the left-hand ruler. From the warm, sunny colors of autumn during harvest time to the more garish tones of Halloween, Fall is full to the brim of exciting color potential! 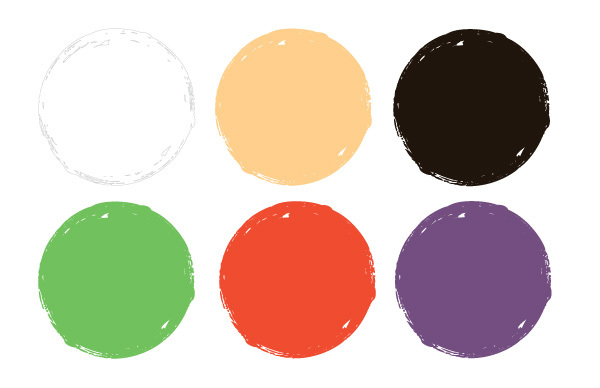 Hopefully you’ve discovered a color palette to suit your design and bring a bit of seasonal edge to your work. 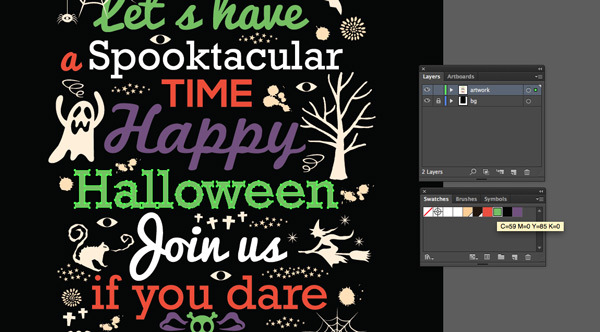 On the hunt for more autumn-themed elements to use in your designs? Check out these season-appropriate photos and vectors over on the 123RF library. January Freebies: Download January’s Collection of Free Stock Content! Download Our April Freebies: April Fools! 2019 Calendar: Make Gift Labels!